Mr. President, It is with unease and a sense of deja vu that I rise today to join the debate over aid to the Contras. None of the policy questions or facts before us are new. Indeed, we as a Nation have been grappling with the Contra Issue ever since the spring of 1982 and the early controversy over the Boland amendment. Since then, we have had to re­ visit this Issue at least once every 6 months. In our discussions, several Senators, myself included, have explored the parallels that exist between United States involvement in Nicaragua and other countries, especially Vietnam. While I respect the differences between Southeast Asia, Central America, and the Middle East, it is important for us to heed the lessons of history especially when we paid for them with our own flesh and blood. Mr. President, our recent experiences in Vietnam and Lebanon have taught us several things, First, It is important for our Government to have the support of the American people In the conduct of our foreign policy-especially when it comes to war. Second, if we commit American soldiers to an armed conflict, we should do so openly and convincingly, with the intention of winning. Dispatching United States Marines to Lebanon as part of an ill­ defined peace keeping mission was a painful and tragic reminder of this lesson. A corollary of this rule is that we should not take military action until we have exhausted every possible alternative, including a mediated, diplomatic solution. The United States should certainly not use military means to solve the social, economic, and political problems of our neighbors. President Reagan’s request for $100 million in additional aid to the Contras ignores these broad lessons of his-tory. Moreover, it ignores specific information that we have developed about the Contras’ battle against the Sandinistas over the past 6 years. First, the Contras have been ineffective in their attempts to topple the Sandinista government. Aside from weakening the Nicaraguan economy and causing hardship for ordinary citizens, the Contras have strengthened, not loosened the Sandinistas’ grip on their country. The Sandinistas have used attacks by the Contras to justify first, the suspension of civil rights, second, the Imposition of a draft, and third, keeping the economy on a war­ time footing. Rather than encourage moderate opposition to the Sandinista within Nicaragua, Contra attacks and atrocities against civilians have enabled the Sandinistas to focus their nation’s attention on the “threat from outside.” Instead of helping the democratic opposition within Nicaragua-as we sought to do in the Philippines¬ United States support for the Contras has consolidated the Sandinistas’ control over a reluctant population. An unfortunate byproduct of the Contra war is that we have driven the Sandinistas into the arms of the very people we want to keep out of Central America-Cubans and the Soviets. Thanks to ineffective trade embargoes and poorly executed military pressure, we have left the Sandinistas no alter­ native but to seek arms, foodstuffs, and economic assistance from the Soviet bloc. In so doing, we are squandering the goodwill that most Nicaraguans feel toward the United States while reinforcing the Sandinistas’ caricature of Americans as bullies and aggressors. Second, the Contras have shown that they cannot win an armed conflict against the Sandinistas. After 6 years of paramilitary action and more than $100 million in aid from the U.S. Government alone, the Contras are no closer to their political and military objectives today than they were at the outset. The President’s request that we commit another $100 million to a losing battle is wasteful and will raise, both literally and figuratively, the United States stake in the Nicaraguan conflict. The need to place United States military advisers in Central America to supervise and train the Contras will increase, not decrease, the likelihood of direct United States intervention in the region. 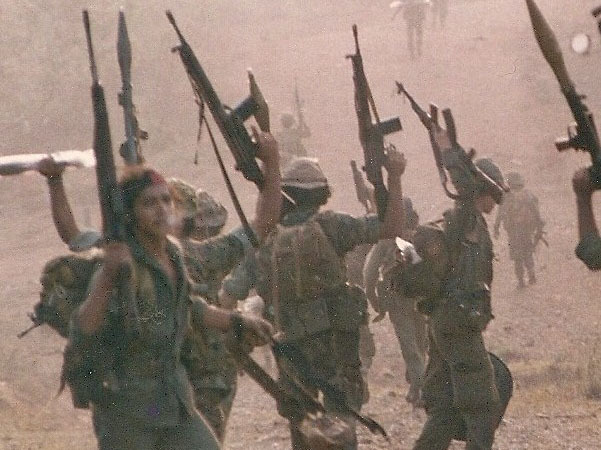 By staking U.S. prestige on the outcome of the Contras’ battle against the Sandinistas, the United States is taking a major step toward the commitment of U.S. troops to the conflict – an event which most Americans agree is unnecessary and undesirable. Third, continued Involvement by our Defense and Intelligence agencies in the Nicaraguan conflict is destroying their credibility and undermining their effectiveness. Our foreign policy depends on good Intelligence, but the CIA’s role In Nicaragua has only tarnished the agency and hampered our foreign policy. CIA activity has violated U.S. treaty obligations and International law. Rather than advance our goals, it has brought the United States adverse publicity and disrepute. In an era of Increased International terrorism and espionage, it is against our national Interest for the CIA or the U.S. Government to be involved with the Contras. A final thought, Mr. President, is this: What would happen is the Contras ever win, either after years of U.S. assistance or direct U.S. military involvement? We might be able to establish a friendly government in Managua, but how would we reconcile the competing Contra factions, one of which is fighting the Sandinistas from Costa Rica, the other from Honduras? More to the point, how would we deal with the Sandinistas, who would no doubt take to the hills and return to their old style of guerrilla warfare? Is the United States prepared to occupy Nicaragua for several decades, as we did between 1912 and 1933? [Note that we never captured Augusto Cesar Sandina, the guerrilla who gave the Sandinistas their name]. What would happen to the insurgencies In El Salvador, Honduras, and Guatemala if the Sandinistas resumed their role as revolutionaries? Would we improve the security and stability of our allies In the region, or would we further de­ stabilize the region and realize our worst fears of terrorist attacks against the southern border of the United States? It clear that peace in Central America depends on a negotiated, political solution involving all the key players in the region. The United States should join the Governments of Central and South America in the Contadora peace process, and, if that bears no fruit, investigate new diplomatic initiatives of our own. Peace will never come to Central America from the barrel of a gun, and we should disapprove the President’s ill-timed and ill-conceived request for additional military aid to the Contras.